At the time of Our Lady’s first appearance, the people of the village under Communism lived simple, frugal lives. Many of the men who survived WW II were debilitated and little able to work; however, many of the younger men worked in Germany, United States, or Italy, sending money home to their families. Each family had a garden and struggled to grow food in the stubborn, unfertile soil. They grew small crops of tobacco and grapes, as well, plowing the fields with antique two-furrow plows and a faithful horse. The farmer scattered natural manure coarsely with a dung fork while his wife or children followed behind to chop and spread it, for everyone worked in the all-important cultivation of crops. Even so, the family’s income was meager since they sold their products for a low price set by the Communist government. Domestic animals and chickens wandered over the dirt roads where children ran and played. The overall scene in the village remained quiet, seemingly caught in a perpetual pause in a filming of time. Life in Sarajevo or Dubrovnik moved more swiftly, but some of the villagers had never strayed that far from the hills and security of home. Then with the appearance of the Virgin Mary in 1981, the curious, the disbeliever, the miracle-seeker from miles around flocked to the apparition site. Almost immediately waves of pilgrims flooded the remote sleepy little hamlet. It all happened so quickly that in time to come the villagers asked one another, “What were you doing the day the Gospa came?” That was the beginning, and Medjugorje was never the same. Our Lady asked that the people of the village welcome the pilgrims. Without running water, electricity, or places to sleep and enough food to eat in some homes, it proved a problem over and over. Still, the pilgrims came, making the best of the situation. They slept where they could; those who were not able to find lodging with families sometimes slept on the floor of the church in bedrolls or on benches or within the confessional even though the church was unheated in the winter and overheated in the summer without cooling. They ate whatever food the villagers gave them from their scant supply. The families moved more closely together in their homes, making a room or a spot available, sometimes giving up their own rooms to the pilgrims (Our Lady must have smiled at their generosity). Then, unable to borrow money but gaining revenue from the people that came, the families began to add on to their homes as they could; still it remained a slow process, but as one villager said, almost in self-defense, “We had no choice.” Thus, for some, occupations changed from farming to guest keeping. The terrain itself changed as they divided some of the tobacco fields into garden plots to grow more food. They penned up the animals and chickens and cautioned the children to not play in the streets as huge buses lumbered down the road and taxis rushed by as if on a frantic mission. In time, the government stopped harassing the people and began to capitalize on the new source of revenue. They began to build guesthouses and opened restaurants and souvenir shops on the main street. The Croatians opened shops as well, and it became easy to identify the locals since they closed shop during the Rosary and Masses. Although change came to Medjugorje, the predominant messages of peace and prayer and reconciliation to God did not change. Spiritual conversions continue. Miracles occur. A quietness and holiness still pervade the village. The old messages are new again as Our Lady recalls forgotten values, reminding us that our future lies in the hands of God and we must prepare for that future. During the Communist regime, the authorities disallowed any kind of construction or renovations—certainly regarding religion. They did not publicly condemn religion, for it would have gone underground creating more problems, instead they tolerated it, issuing rigid restrictions. The story of St. James Church began in 1897 with the construction of a small church five years after Medjugorje became an independent parish. When the structure began to crack and its tower began to lean, the parish learned that the church sat on sinking soil in a quake-prone spot. After WW I, the parish designed a larger church, yet delays prevented the forming of its foundation until 1936, and construction did not begin until 1940. With WW II and Yugoslavia’s civil strife, nothing more was done to the church until 1966. Finally, though the interior remained unfinished, the Franciscans blessed St. James Church on January 19, 1969. The event attracted little attention beyond the few people who lived in the area of the parish who little understood what inspired them to build such an enormous church that could hold as many as 2000 people. In 1981, with the Virgin Mary’s apparitions and the huge influx of pilgrims that filled the church, the people understood God’s motive. 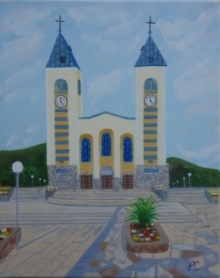 With attention focused on Medjugorje, the parish of St. James began to make improvements as finances and authorities allowed. The people covered the church with a sheet of copper and installed stained glass windows by Branamir Dorotic in 1987. They paved the large area in front of the church and added the statue of Our Lady. Other needed additions included a large gazebo with extensive use of marble located at the back of the church, and “Domus Pacis,” (the House of Prayer) that included an adoration chapel and space for seminars and other events. The parish also added a hall for pilgrims that can be divided into three sections, 20 outdoor confessionals, a suitable sanitary area, a service area to include a garage for cars of visiting priests, and a first aid station. All these additions form a facility in stark contrast to the church that sat alone in the middle of vineyards only a few years ago. The six children of Medjugorje, who first witnessed the Blessed Virgin on June 24, 1981, are today adult visionaries living in the constant spotlight and scrutiny of a watchful world. They try to live as privately and devoutly as possible while continuing to remain visible, making appearances, receiving groups, and answering questions. With the exception of Vicka, they all are married and have children, so they must balance their time as responsible parents with that of responsible speakers for the Blessed Mother. It cannot be an easy task, for in addition, some of them spend time traveling to spread her messages. Mirjana Dragicevic attended the University of Serajevo and is married to Marco Soldo, a fellow university student. They have two daughters and live in Medjugorje. Her annual apparition is her birthday, March 18. She also prays with Our Lady on the second of each month for unbelievers. Mirjana warns that the painful events for humanity, the time of purification for the world, are very near. At this time the world will know that God exists. The meeting with God will be painful for those who have not converted. The ones who feel God as their father will not be harmed. Jakov Colo is married to Annalisa from Italy. They have a son and a daughter and live in Medjugorje. The Blessed Mother revealed the tenth secret to Jakov on September 12, 1998 and told him that she will appear to him at Christmas each year. Marija Pavlovic is married to an Italian named Lunetti. They have three sons and live in Italy but return often to Medjugorje. In 1988, Marija went to Birmingham, Alabama to donate a kidney to her older brother Andrija whose life was in danger. The Madonna appeared to Marija for the duration of the three-hour operation. Marija’s sacrifice exemplifies the message Mary is giving—to give in love to others as Jesus gave to us. Vicka Ivankovic lives in Medjugorje and receives pilgrims at her family home. She explains that the Madonna…embraces us; we can touch her…Vicka says that on special occasions—Easter, Christmas, anniversary of the apparitions—she comes dressed in gold. At Christmas she appears with the baby Jesus in her arms. Ivan Dragicevic is married to Colleen Murphy, an American, and they have two daughters. They live six months of the year in Boston, USA and six months in Medjugorje. Ivan attended a Franciscan seminary for a time, but felt that his calling was not that of a priest. Today, Ivan is the leader of a young peoples’ prayer group that meets weekly on Apparition Hill or Cross Mountain. In addition to her daily visits to Ivan, Our Lady appears to him near the Blue Cross in the evenings at designated times. A note of sadness: On November 24, 2000, Fr Slavko Barbaric, the beloved priest of the St. James and the spiritual advisor to the visionaries, died on the top of Mt. Krizevac (Cross Mountain). He had led about 70 parishioners on the "Way of the Cross," as was the parish's custom on Fridays at that time. Upon reaching the top of Cross Mountain, the sun came out, the rain stopped, and a beautiful rainbow appeared in the sky near the church. As the group descended, in front of "The Resurrection" station, Fr. Slavko slipped and fell. He suffered a heart attack and died instantly. Since the beginning of the apparitions, the credibility of the six visionaries has remained intact. They have never contradicted themselves in relating the messages of the Blessed Mary. In addition during these years they have been subjected periodically to every type of medical and scientific examination available. * They simultaneously knelt and looked at precisely the same spot (without a visible reference point) when the Virgin Mary appeared. * They knelt and ceased all eye movements from three to 45 minutes. None blinked in response to touching the eye. * They did not react to pain during the apparition. When touched with an algometer (that causes a lesion or skin burn) there was complete absence of sensitivity. * They showed no reaction to a hearing test, an input of 90 decibels (equivalent to a loud explosion) in their ears. * They did not blink when a 1000 watt light bulb was placed in front of the eyes. * Their voices stopped during the vision. Though all muscles (mouth, jaw, and throat) involved in speech continued, the larynx shut off. This is physically impossible. Father Svetozar Kraljevic of St. James Church reports that another team of 12 university professors, scientists and medical doctors from different fields observed Vicka, Marija and Ivan in Milan, Italy for five days in April 2000. This was the most serious approach with the most sophisticated equipment ever done on the visionaries. Findings are pending at this time. A controversy exists today regarding the importance of Mary. Some people feel that she was simply the earthly mother of Jesus and that too much honor is given her, detracting from our worship of God. Christian tradition holds, however, that at the crucifixion, Jesus gave His Mother Mary to each of us as our spiritual mother. The apostle John was present with Mary as Jesus said, “Behold your Mother.” (John 19:27). Thus, many believe that Mary’s purpose on earth was to bear the Son of God, the living bread. Through her, with her, and in her, God became man. Her purpose now as God’s most perfect servant is to bring us closer to him. Her messages focus on those of the Bible as she urges us to pray to her son. And since we often ask our earthly mothers and others to pray for us, it is quite natural to ask our Heavenly Mother to pray for us also. One may ask, has the Pope or the Vatican approved the apparitions? In a word “no.” To digress a bit, much has been written and said about the conflict between former Bishop Pavao Zanic of Mostar, in which the diocese of Medjugorje is located, and the Franciscan priests. Bishop Zanic opposed the apparitions after initially supporting them in the first few months. His opposition is a political one and stems from a local feud between his office and the Franciscans priests over parishes he changed from Franciscan to secular authority. Bishop Zanic had another reason to change his stance regarding the apparitions. In the beginning, the Communist atheist state in Yugoslavia noted that the Bishop’s positive approval of the apparitions stood in contrast to the official state attitude toward the events which they suspected were counter-revolutionary. (This was at a time when it was dangerous to utter even a word in favor of Medjugorje.) Consequently, they summoned the Bishop to Sarajevo and threatened to imprison him unless he stopped speaking in favor of the apparitions. They threatened Father Jozo as well, but he continued to act according to his convictions. Bishop Zanic called Father Jozo and said to him, “I am not ready to go to prison for Medjugorje.” The Communists arrested Father Jozo along with Father Ferdo Vlasic and Father Jozo Krizic for their beliefs in the visionaries. Because of his fears, Bishop Zanic said nothing at all publicly at first after his meeting with the authorities. After that, he began to speak against Medjugorje. To the visionary Vicka Ivankovic, who met with the Pope along with Croatian soldiers on March 22, 1995, the Pope said to her, “Pray to the Madonna for me. I pray for you.” And among other comments the Pope made about the Shrine of Peace was made in 1987 to visionary Mirjana Soldo: “If I were not Pope I would already be in Medjugorje confessing.” The Pope has made other favorable comments as well. Today, the current attitude of the church is a kind of provisional approval of Medjugorje. Both the Pope and the former bishops are treating and nurturing the Shrine as a legitimate place of pilgrimage. The Pope said, “Medjugorje is the fulfillment and continuation of Fatima.” Presently, the investigations of the Shrine are entrusted to the Commission of Inquiry of the Episcopal Conference.